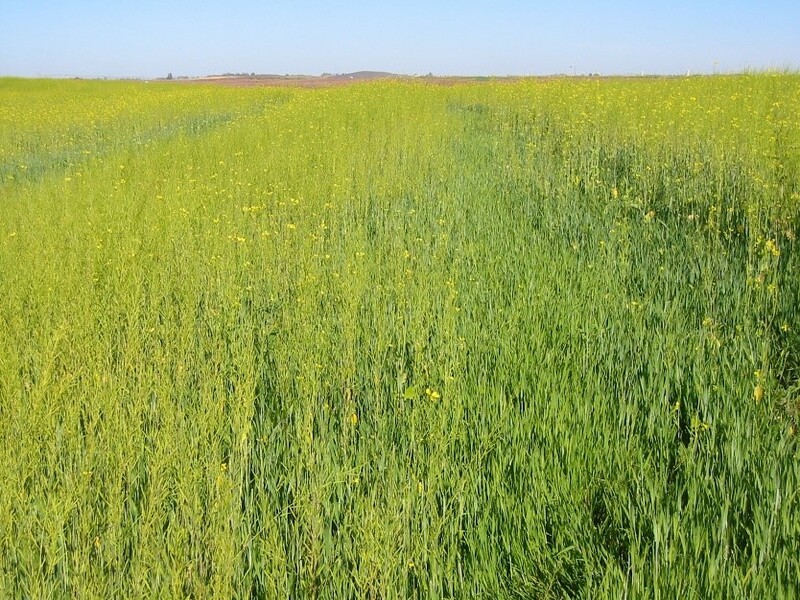 A spindly mustard crop with few leaves will not give the big biomass needed for success. Photo: A. McGuire. Green manuring is the lesser-used option in cover cropping. Most cover crops are killed and left on the soil surface, but green manures are tilled into the soil. That is where they have their unique effects. They feed soil microbes and larger organisms and thus change the community composition to benefit crops that follow. This enlarged soil microbe community then produces more stable aggregates and better soil structure for overall increased soil function. However, for the benefits of green manures to outweigh the tillage required by the practice, a large amount of biomass must be grown. Tillage breaks down aggregates, disturbs soil microbial communities, and quickens breakdown of organic matter. Biomass does the opposite. The more plant biomass incorporated into the soil, the more steps forward the soil takes to overcome the backward steps of tillage. The key factors in producing biomass are time, temperature, water, and soil fertility. Sunshine falling on green plants when temperatures are conducive to plant growth is the basic currency of farmers. For profit they give cash crops the best days but parceling some of the summer heat to a green manure crop can give a green manure crop the boost it needs to produce big biomass. Days can make a difference. 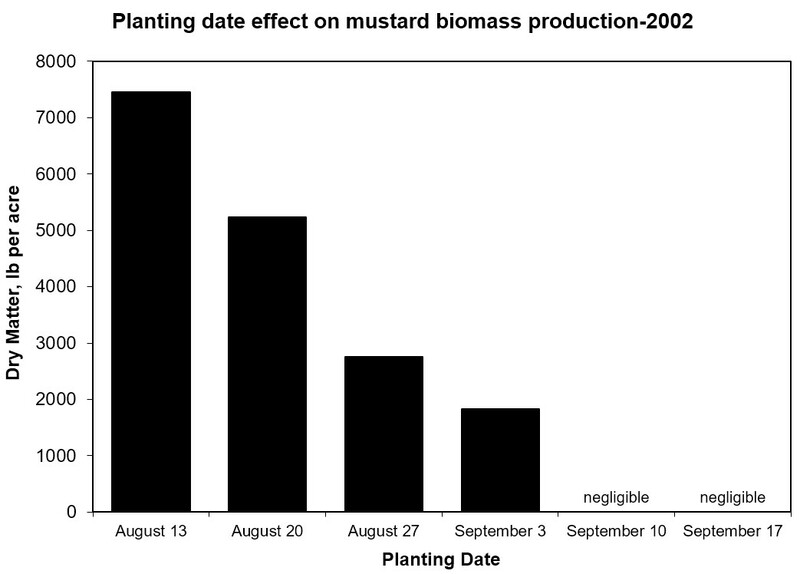 Consider this planting date study of a mustard green manure crop grown after wheat near Moses Lake, WA, in 2002. A day or two in August is worth a week or more in mid- to late-September due to lower temperatures and reduced daylight hours. 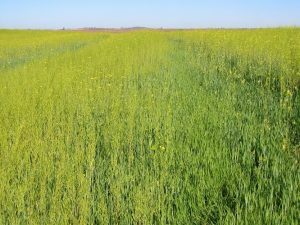 The same is true for the spring; overwintering legume green manures should be allowed to grow into May or June to give enough benefit to cover seed and planting costs. Planting in August may be the best time for plant growth, but it is also the hottest, driest time of year in the arid West. Big biomass will not be possible without irrigation. Where water is expensive, the cost can be prohibitive. The timing of irrigation is also important; a green manure crop stressed for water will shift from vegetative to reproductive growth. The earlier bloom will reduce biomass production. The same goes for competition from weeds. Ideally, weeds will be out-competed by a fast-growing green manure crop planted in a field with low weed pressure. However, planting after a cash crop like wheat, while allowing good sun and temperature for the green manure crop growth, also sets up the volunteer wheat crop to become a major weed. Volunteer wheat and other weeds reduce green manure biomass by stealing sunlight, water, and nutrients. To get big biomass, weeds must be controlled. If necessary, as with volunteer wheat, with a selective herbicide. Killing the volunteer wheat in a mustard green manure (see Mustard Green Manures PDF) can also assist in controlling parasitic nematodes in potatoes (a crop that often follows green manure), as wheat is a good host for some of the nematodes. Green manures are not the plant-it-and-hope-for-the-best variety of cover crops. Although that can work for crops planted only to protect the soil from erosion, the big biomass required to make green manures beneficial require high soil nutrient levels. If you are applying only what the previous cash crop needs, then there will be little left over for the green manure crop. Biomass is the key to green manure’s benefits; soil fertility, including fertilizer application, is the key to biomass. Because of the tillage, big biomass is not an option with green manures. Biomass is not only important for individual crop’s benefits but may be important over time – more on green manure biomass frequency in a future post. If you are not going to manage the sunlight, temperature, water, and nutrients, you are better off planting a cover crop that will not be tilled into the soil. This post is Part 2 of Green Manure series; read Part 1. Pieters, A.J. 1927. Green manuring. John Wiley & Sons, NY. One thought on "Without big biomass, green manures are a step backwards"
It found that 22% of the green manure biomass remained in the soil after one year. This is on the high end of the range that I have seen, but for some reason, legumes are better at adding organic matter to the soil than non-legumes. This also shows that a certain amount of the crop (the 0.68 Mg C/ha mentioned) is required just to maintain soil organic matter levels. Green manures producing less than this amount – which will depend on soil type, climate, and management – will be taking a step backward in soil health. The graphical abstract is interesting.